Luke 5:12 KJV And it came to pass, when he was in a certain city, behold a man full of leprosy: who seeing Jesus fell on his face, and besought him, saying, Lord, if thou wilt, thou canst make me clean. “if thou wilt, thou canst make me clean”. In other words, if you want to, you can make me well. Can I go a bit deeper here? This man knew(he had an understanding) that Christ COULD heal, but he did not know if Christ WOULD be WILLing to do so. This simple phrase says something to me. This man was in the presence of Christ but did not understand the power of Christ…nor the heart of Christ. Now since Cup of Joe readers are a very spiritual bunch, I beseech you to stop praying like this. “If thou wilt…” only makes the statement that you are unclear as to what the Lord wants to do. You know that the enemy comes to steal, kill and destroy. Jesus comes to protect and preserve, to give life and to build up the new life that He gives! He has given us His Word so that we could read it, meditate upon it and begin to understand it by seeing the patterns of behavior. Everywhere Jesus went, the power of the Holy Spirit was in operation. In some places that meant miracles. Still, in other places, miracles did not happen. So what was the difference? Did that power just come upon Him in some cities and not in others? Jesus would settle the question for this man covered in leprosy. 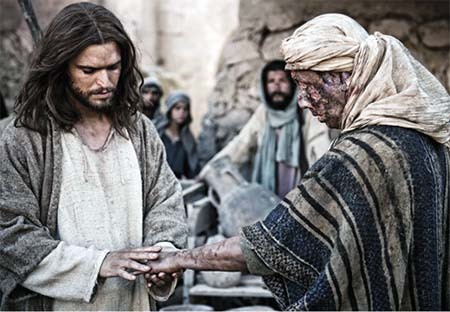 Jesus touched the man…and said “I WILL” and immediately the leprosy was gone! Everytime that Jesus was placed in the a situation to fulfill the WILL of His Father, He made that very clear. God’s WILL is already been made known. He came to heal the sick and save the lost. To engage the power, to initiate the Spirit within us, we need to keep going deeper. Why did miracles happen in some cities and not in others? Did Jesus have “off” days? John 15:7 it says "If ye abide in me, and my words abide in you, ye shall ask what ye will, and it shall be done unto you". Wait a minute! We have a say in what happens to us? Do you mean that it matters what WE think? Yes! Your desires need to be synchronized with His desires. So that when He gives you the desires of your heart…the things that happen for you are in line with that abundant life He promised you! Ask what YOU WILL! What do you want to see happen? You know what the will of the Lord is. Do those two match? If not, change your WILL to match HIS will. You see His will does not take a break and is never tired and burned out. The Spirit WILL always be WILLING…but the flesh is often weak. When our WILLingness is in step with His WILL, miracles happen.